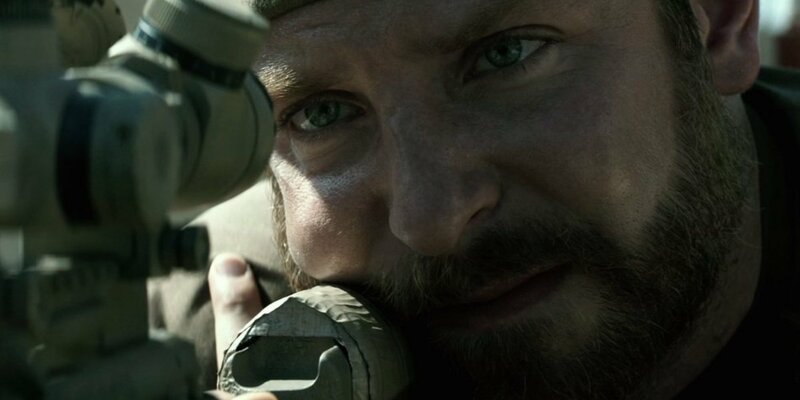 American Sniper opens to an Iraqi mother and son approaching a group of American Navy SEALs. Something is off about her gait… her arms aren’t moving. She is holding something beneath her clothing – an RKG Russian grenade – which she hands to her child before sending him running toward the platoon. All of this is witnessed through the scope of Chris Kyle’s rifle whilst his finger rests on the trigger. This gripping open to Clint Eastwood’s latest contains the essence of the film: the intense focus and moral deliberation (or lack thereof) of decorated SEAL Chris Kyle (Bradley Cooper) caught in extreme close-ups, fast-paced editing and confining sound design. An adaptation of Kyle’s best-selling autobiography, the film carries his values and moral certainty in tone, but also in Cooper’s performance – suitably beefed up and puffed out with a deep Texan drawl. Accumulating 160 confirmed kills (255 unconfirmed) over four tours of Iraq earned him the title of ‘Legend’ among friends and ‘The Devil of Ramadi’ among Iraqi insurgents. Burly, brave but never boastful, Kyle’s dedication to God and his country is unwavering, though it is certainly tested by the many faces of evil that threaten his brothers-in-arms. The binary division of heroism and pure evil can make the film appear cartoonish at times – more a western than a war film – with Kyle’s patriotism becoming the most aggressive thing about him. Shown to be a gentle and compassionate man, we are shown the struggle he has in returning back to ordinary life with his wife (Sienna Miller) and kids. Intending to give a more rounded view of the most lethal sniper in the US military, these familiar scenes feel tired and almost obligatory. It is in the combat scenes that Eastwood flourishes, unsurprisingly. At one point, dizzying direction places you at the heart of a shootout when all figures in the frame are swallowed by a sandstorm. These moments of raw cinematic action deliver concentrated doses of suspense that make the film worth seeing.